LaVar Ball made a fool out of himself after President Trump had a word with President Xi and got Ball’s son and two other UCLA basketball players released after shoplifting in China. They were staring at a 10-year sentence for that and a couple of hours after Trump spoke with Xi, the boys were on their way back to the United States, safe and sound. Ball was not grateful in the least and claimed that Trump had nothing to do with his son’s release. What kind of jerk does that? Trump called him a fool and rightfully so. But there is a mother out there whose son has been in prison in China for over a year and she is the antithesis of LaVar Ball. Antoinette Brown has been on a 14-month long quest to bring her son home from a Chinese hell-pit of a prison. 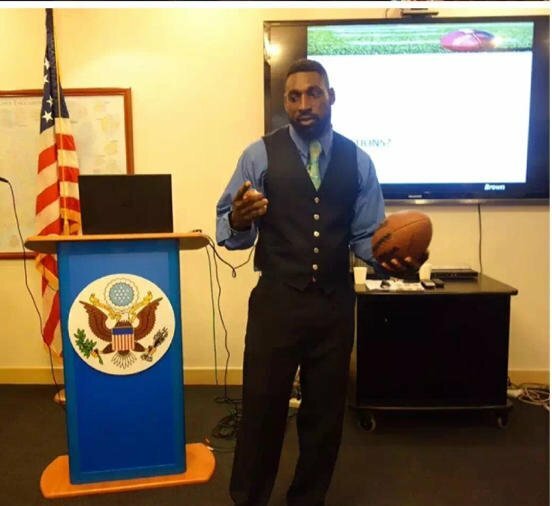 Wendell Brown went to China to teach players to speak English and to help coach a football team. He had been there for a year when this happened. He went to a friend’s birthday party at a bar — that was his first mistake. Several locals got in a fight with him because he would not drink with them. They viewed it as disrespect and got loud about it. Then they threw bottles at him and threatened Wendell’s life. The Chinese only arrested Wendell — this is China, what did you expect? They charged him with intentional injury. Now, his mother is turning to President Trump for help to bring her boy home. She’s pleading with him to help her save her son. “It’s been absolutely devastating,” she said. “Just not to be able to see my son, talk with him, like we are used to. It has taken a toll on my entire family. A group of locals wanted to take pictures and drink with them,” Antoinette said. “When they noticed that they were already too drunk and were (acting) disrespectful to him, so he decided not to. They were upset that he declined and started throwing bottles at him. Wendell defended himself by throwing his arm up to block the bottles. The police were called, they came and arrested Wendell only.” That does not surprise me in the least. Brown appeared on “Fox & Friends” to tell her story of trying to get her son out of a Chinese prison. “Another mother whose son is stuck in China pleading for President Trump to help her son who has been held in Chinese jail for over a year,” Griff Jenkins said. “She says she would never stop thanking President Trump for his help.” That’s someone Trump should help if he can. This mother is terrified and beside herself over this. She doesn’t have the ‘pull’ to get him out of that prison and returned home. According to Wendell’s mother, there is video that supports Wendell’s claim of self-defense. Also the man who accused Wendell in this case, tried to extort $100,000 from him. When he realized he could not pay it, the man admitted in court that he falsified the events of that night. “Antoinette, let us give the floor to you here right now,” Griff Jenkins said. “What would you like to say to President Trump right now?” “I would humbly ask for him to help my son that’s in an unfortunate situation,” Brown responded. “And I would be truly grateful. And most definitely would thank him with no problem.” This poor woman just wants to get her son back. He’s an American in a Chinese prison and someone at the State Department should be working on getting him freed. Paging Rex Tillerson. The U.S. State Department says it is doing everything it can to bring Wendell home, adding right now their main focus is making sure he’s being treated fairly and protecting his health and safety behind bars. That’s not good enough guys. Not even close. This mother is the exact opposite of LaVar Ball, who is an arrogant, ungrateful moron. He has gone to the media and fed into it that Donald Trump is a “racist,” despite the President working to free his son from a Chinese prison. That was a personal favor that President Trump asked of President Xi and somewhere down the road, there will be a return payment due on it. Antoinette would be forever grateful for any help that President Trump can provide her son. She realizes how serious this is and what he must be going through. This would be sincere gratitude for saving her son’s life. Unlike Ball, who has made all of this about himself and has grandstanded for the media non-stop. The media has not covered this woman’s plight at all. This mother puts LaVar Ball to shame and then some.